Very awesome. I still think Spore should make the creatures look less like a cartoon, and more like an alien, but still pretty cool. How much did it cost? They cost approximately 50 US dollars, even if it's a little slug, I believe. Might get one of those someday! Look what I found on the net. It made me laugh. 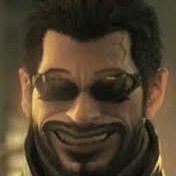 Ulins Grelvicks is a Naucean who lived in the United States of America and the 69th president of the United States of America. He was the first non-human who was elected to office. Oh, I didn't know you read that site too Hydro. On Topic: Oh, hey, great creature, glad to see it getting outside recognition. Beside praise from Maxis. At the end of the Post Ascension Age many Nauceans who had not ascended eventually died out across the universe. However a small population still survived in Beyon City. Without their own district they assimilated into many diffrent cultures and districts within Beyon City. Memories of the once powerful Naucean Empire faded from memory and went into myth and legend. Only a few remnants of Naucean culture survived such as architecture, vehicle design and even some cuisine. However no one in Beyon City really noticed since it become so much integrated into the culture of Beyon City. The Nauceans themselves even forgot where they came from and became like any other species trying to make it in in Beyon. They were still highly adaptable and took on any job. 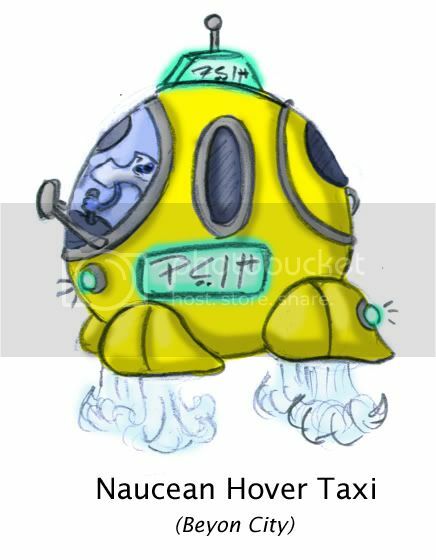 In fact Beyon City is now known for its Naucean Hover Taxi divers who fly around in bright yellow flying bubble cars. I find it interesting how your drawing skills haven't improved one bit in the past few years. In fact, I'd go as far to say that they've just gotten worse, what with all your brightly colored panorama pictures in the Sagan 4 forum. There are different hues to colors and all environments reflect some of their color to everything in that environment. There is no "easy way" to learn all that, but practising coloring by trying to accurately copy the color in some photographs would improve your understanding of colors a lot, I think. Also, your shadowing just doesn't look right, so you should probably practise on that. Where's the light coming from in that picture? Why are the shadows so uneven on such a smooth surface? Different surfaces also reflect color differently, and that, too, should be able to be seen in your drawings. Look here, for example. And read the rest of the tutorial, too. The way things are right now, I think your drawings are just a pain to look at. Also, get a pen tablet if you can. >_> Or start using traditional media to color your drawings.